← From the Archives & Special Collections: Happy Valentine’s Day! Have you visited the Zine Collection at Collins Library? Often used as medium for personal expression or political resistance, zines are small format, low-budget, and self-published booklets that address topics and viewpoints that are not represented in mainstream media. 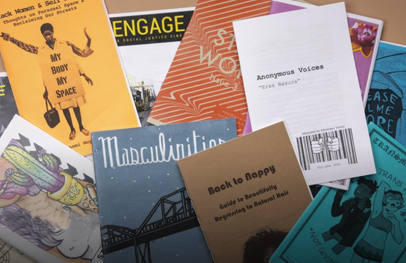 At the Archives & Special Collections, we have a growing collection of around 250 zines on a variety of topics, both personal and political, including several authored by Puget Sound students. Take a deeper look at our zine collection with Humanities Librarian, Katy Curtis, in this new video from Arches and visit us in A&SC to learn more! This entry was posted in Arts/Humanities, Arts/Humanities, Social Sciences & Science, Featured Resource. Bookmark the permalink.